Choose One Of These Mandalas And Discover What It Says About You! Mandala is a spiritual symbol in Buddhism and Hinduism which represents The Universe. These days, mandalas have become the common term for any chart, geometric pattern, or diagram that represents the cosmos. Interestingly enough, mandalas happen to tell a lot about a person’s personality too. 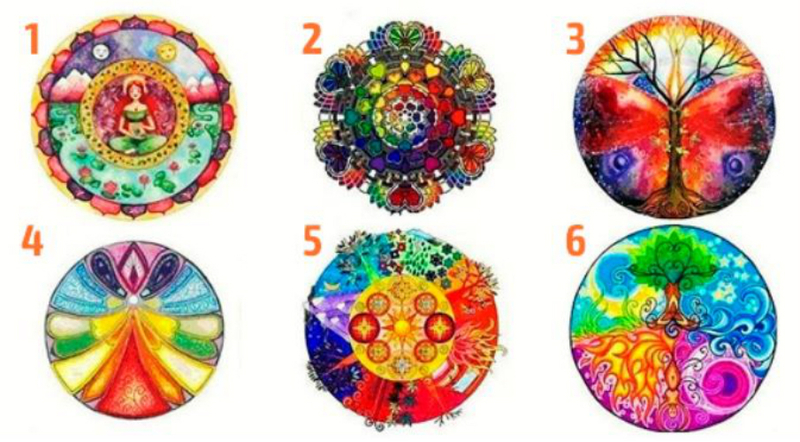 Pick one of the 6 mandalas that resonate most with you from the image below, to see what it has to say about you and your personality! You have high standards and ambitions, striving for the better all the time. While most people have a difficult time getting along with you, it is even more difficult for you do deal with yourself. You are hard-working, but this rarely pays off for you. You are working hard for the greater good and your goal is to make the world a better place. Unfortunately, only few people appreciate the things you do. You simply enjoy taking care of others. Being highly responsible, you take responsibility and honest work seriously. You are a good person who inspires others and whose character shines bright. Your thoughts and ideas are brilliant and you are a great mind. However, you are introvert who likes to spend time alone, thinking about your theories and beliefs. You get pretty well with people who are eager to learn. Most importantly, you are always trying to the best thing, even when most people don’t agree with you. You are truly one of a kind and no one can compare to you. While you may seem strange, you are highly intuitive and creative. The only problem is that you are emotional and often hurt by people who don’t understand you. You see things clearly, both the good and bad sides of life. You stick to the saying “do it yourself”, so you are highly independent. You trust yourself only and know how to keep your own strength of spirit. You are fully aware of the things you want from life and you are ready to do anything to get it. Honest is the only you thing you ask from others. You have a large circle of friends as you are great at social bonding and building healthy relationships with others. You have a bright aura and people feel good in your presence. You are noble and sensitive person who constantly thinks about ways to improve yourself.